Did I say “bath and shower” pics? Because I mean drawings. Sorry, sickos. 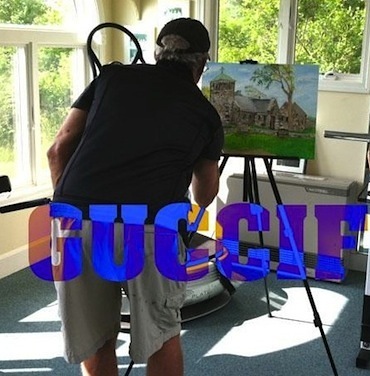 To the left is an actual photo of George Bush THE ARTIST. Naked George Jr. by camera may be more “valuable” in terms of Google searches and common perverse curiosity, but you and I both know that a self-portrait of him soaking his feet in the tub is somehow priceless. This is the result of a hacker (thus the giant “Guccif[er]” logo, though I think “Bushwhacker” is way better) who leaked the content of the entire family’s phones and email accounts. Let go of your past feelings. That whole worst president of all time who made up words, aimed his bellows at the recession and “forgot” the people of New Orleans thing. Ancient history. When envisioning J.R.R. Tolkien’s The Hobbit and The Lord Of The Rings trilogy, some people use images in their heads concocted from reading sessions while others think of Peter Jackson’s films or the late 70’s cartoons by Topcraft (precursor to Studio Ghibli). Others could imagine something like this. 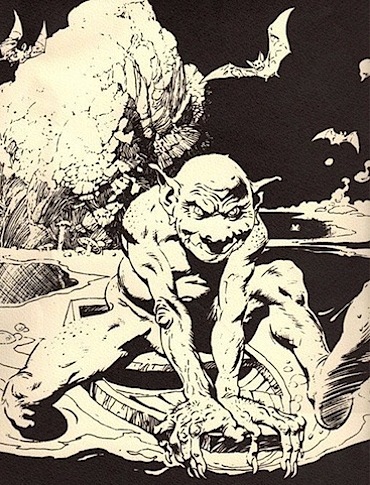 Limited edition Lord Of The Rings illustrations of Gollum, Bilbo Baggins, Nazgûl, orcs, Éowyn, Gandalf, and dwarves by legendary fantasy/sci-fi artist Frank Frazetta. Frazetta, known for Conan The Barbarian paintings (one sold in 2009 for $1 million), Molly Hatchet album covers, and various comic book work, published these drawings in 1975 to a mere 1,000 lucky people. 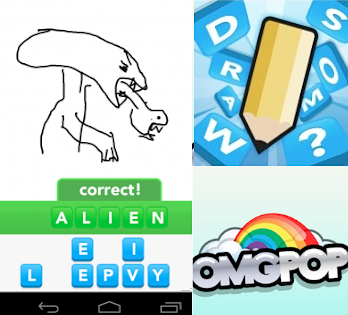 The rags-to-riches story of developers OMGPOP may in fact be a rags-to-riches-to-rags story, or rather for Zynga – the company that spent $20 million for their hit app Draw Something. Now their stock is plummeting and there’s a vast decrease in active players. A report by Appdata shows that 14 million were drawing and guessing up a storm in April and by May those numbers had dropped to 9.2 million. 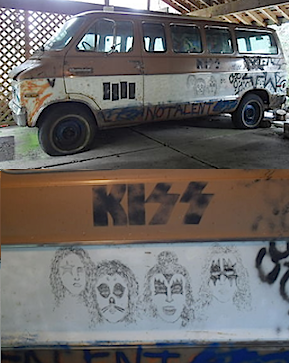 The Melvins old tour van (affectionately known as the “Melvan”) is up for sale on eBay , significant because the exterior has a Kiss mural drawn by none other than Kurt Cobain, who used to chauffeur to band to their shows before the formation of Nirvana in 1987. The seller is fan/musician Ben Berg, who was gifted the vehicle by the mother of founding Melvins bassist Matt Lukin, in 1992. It’s a junkie 1972 Dodge Sportsman Royal Van and the minimum bid is $99,99.99 though Berg is hoping to get around $135,000. for it. In the midst of a photo shoot with Annie Leibovitz for Vanity Fair at Tony Bennett’s studio, a very naked Lady Gaga was seen by a very cool and collected silver fox. I’m going to assume Tony has seen his fair share of groupies and nudies, so instead of booking it the hell outta there, he stayed and did a sketch.